Avoiding bad hosts is as easy as understanding how and why bad hosts exist, as well as learning how to spot the tell-tale signs of a potentially unpleasant hosting experience. Part One of this three-part editorial series examines the issues of misrepresentation and the lack of industry oversight. In most industries, false advertising is a serious issue that quickly results in fines being levied by the government, losing lawsuits in court, and being excoriated by the press. The use of deception or misleading advertising is often an act of desperation to stave off loss of business to competitors with better products, services or policies. 24/7 support that doesn’t actually exist. 99.9% uptime that never happens, even when service level agreements (SLA) exist. “Unlimited” resources that are significantly curtailed in the fine print. The biggest nuisance is easily the farce known as “unlimited” hosting, where a host promises unlimited space and unlimited bandwidth, yet hides draconian limits on how you may use the space and bandwidth in the Terms of Service (ToS) or Acceptable Use Policies (AUP). Most of them unreasonably restrict common content found on websites in the 2010s: photos, videos, audio, file downloads. Some outright ban certain content altogether! The “unlimited” host therefore ends up being more restrictive than a host who defines how much space and bandwidth is available. In fact, the entire concept of unlimited space and bandwidth is archaic, given how most modern CMS-based websites primarily use CPU, memory (RAM), and MySQL connections (also RAM). WordPress-based sites, for example. Most unlimited hosts are infamous for heavy-handed enforcement of the hidden limits, which many consumers consider to be contrary to the “unlimited” use advertised. Another consequence of offering “unlimited” hosting is that a host attracts a lot of customers, and then proceeds to cram as many as possible onto a server, over-allocating/overloading it in the process. (This is sometimes referred to as “overselling”, though it’s not really accurate use of that term.) 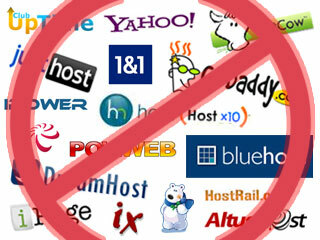 The host profits immensely, while the customers are stuck with slow sites. Food, beverages, herbs, vitamins and supplements with false health claims. Pyramid schemes promising that you can make a six-figure income working from home. Weight-loss products claiming that you can lose many pounds in just a week or month. And yet certain promises made in the hosting industry are equally as misleading to consumers. Someday the Federal Trade Commission (FTC) will catch up to these companies, fine them, shame them, and end these ridiculous lies. In the meantime, be wary of promises made by hosts. The web hosting industry has slowly been commoditized over the past decade, to the point where there are virtually no barriers to entry. Unlike the 1990s, would-be business owners no longer have to produce any start-up capital. Fraudulently sign up for Paypal; i.e., lie about being 18 when ticking the box. Spend $10 on a cheap reseller account. Use a free or nulled/hacked website template. Setup open-source or nulled/hacked support and billing software. Hide the whois on their domain. I think most folks would be shocked at the number of hosting “businesses” online that are run from the bedrooms of teenagers, or out of college dorm rooms. In fact, many small hosts are run by individuals who are in their teens or early 20s, and many of them lack prior experience in either IT fields or customer service. To many of them, running a hosting “business” is just an extension of their experience playing online video games. Quite a few hosts are also run by residents of second-world and third-world countries, where an income of just a few hundred dollars can provide a month of wages. For this reason, they target U.S. and UK customers without disclosing that the “business” is run from an internet cafe in Africa, the Middle East, or Eastern Europe. For many of them, this is purely about bilking money from foreign suckers, as opposed to providing a reliable service. The 2nd part of this three-part editorial series will discuss the effects outsourcing and advertising have on the existence of bad hosts.